Sandstorm: Pirate Wars is set in a post-apocalyptic world, where ships are built from scarp, where bolts are standard currency, and where survival depends on how brave and ruthless a pirate is. As a pirate, you will take control of a deadly sandcruiser and fight your way along deserted roads. You can customize your ship, equip it with deviant weapons and take it to the barren roads to battle rival pirates for survival and fame. 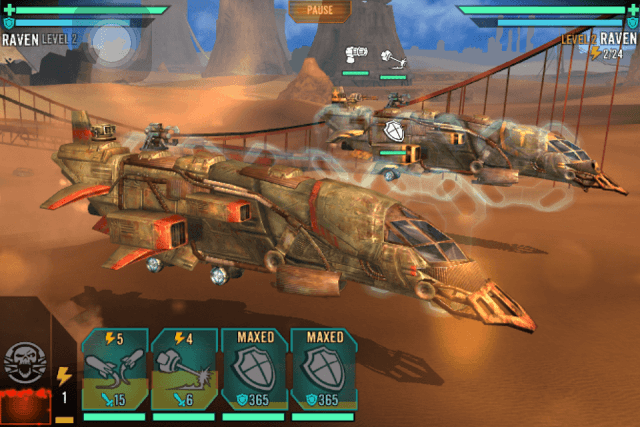 Sandstorm: Pirate Wars’ most impressive feature is its real-time multiplayer system. You can fight players and rank up the leaderboard for rewards. The game’s match-making system matches a similar-level player, making battles more fun and engaging. There are also story-based missions and gigs that will provide plenty of opportunities to earn bolts, systems and other items for your sandcruiser. These quick tips, hints and strategies will help you win main missions and PVP battles. Tap on an enemy ship’s shields when the countdown timer starts. This way you will get the first strike even before your opponent’s ship attacks your support systems. Striking first will give you an edge in battle. You have a few seconds to analyze enemy’s ship. The game shows where its shields, flares and weapons are placed with icons above each system, giving you a clear idea of an enemy ship’s attack and support systems. Don’t waste any time and tap on the shields first, you can later select flares and finally the weapons to reduce enemy ship’s HP faster. Once the enemy shields are destroyed, it would be much easier for you to blow up other systems. Just make sure your ship’s flares/shields and refilled. Tap on the flares/shields icon when it asks for refilling. Refilling them will make it harder for enemy ship to pierce through your ship’s defenses. Your ship’s weapon will remain idle after destroying its target. You will have to tap on the new target. Tap on a flare or a weapon soon after the shield gets destroyed. Some weapons, such as the Blaster, can launch multiple attacks. It will attack adjacent systems randomly along with the chosen system. However, once the chosen system is destroyed, you will have to tap on another system to resume attack. Quickly choose a new target when the enemy ship system’s health bar is reduced to zero. As you progress, you will get access to powerful systems via crates, loots and rewards. Higher grade systems can boost your ship’s weapons and defenses. Once you have chosen the best systems for your ship, it’s time to upgrade them. But upgrading a system requires resources, which can be acquired by completing higher level gigs. Keep completing story-based missions and higher-level gigs. Once you have collected the required resources, you can upgrade a system to increase its health and damage. Gigs or side-quests grant more rewards. Each gig has a difficulty level, which can be seen the top-right corner of the screen. Higher the level, harder it will be to destroy an enemy ship. But then the rewards that you will earn will also be more than the ones having a lower difficulty rating. Make sure you upgrade your ship’s system, equip weapons that inflict more damage and have a great system health before accepting higher-difficulty gigs. You may decline an offer, come back later and take the same gig when you have built a stronger ship. The game displays three types of loot after winning a battle. Of these three, choose Ace Loot. It costs bolts, which can be easily acquired by completing gigs and missions. The one big benefit of choosing Ace loot is the items it grants to players. You may receive a rare system that has a much higher damage rate and/or system health than the currently equipped system. You may also receive power cells. Sometimes, Ace Loot grants 2 items, which include bolts. Epic loot gives better systems, but they cost power cells, which are hard to earn. The ship requirements of some attack and support systems are high. They can only be equipped to a ship that has reached a certain level. These systems can boost your ship’s assault and defense and help you destroy enemy ships faster, whether you are in PvP mode or playing a story-based mission. Upgrade your ship to equip higher level systems to it. Upgrading your ship also improves key attributes, such as attack and defense, which are denoted by sword and shield icons. You can upgrade your ship immediately using power cells or you can use bolts. The latter can be easily acquired, but you will require plenty of bolts to level-up your ship. Thankfully, there are several ways to get them. These include PvP battles, gigs and story-based missions. Try to complete Daily Missions before they expire to get extra bolts. The game matches two similar-level ships in PvP mode, so make sure your ship is equipped with the best attack and support systems once you have upgraded your ship. This will help you win battles against a same-level ship in player vs. player tournaments.